DALLAS—Classical Chinese dance may not be a form many people are familiar with, but it is one they instantly resonate with. Dance is a universal part of human culture, and classical Chinese dance is grounded in 5,000 years of a divinely inspired civilization. Onstage, Shen Yun Performing Arts presents classical Chinese dance to cover China not only through the ages, but geographically, touching on the folk and ethnic dances of many of the 50-some minority groups across China. “I think it’s very insightful. For one, it’s culturally enriching. … It’s also one [experience] that allows me to see and absorb not only just the dance aspect it, but you get to hear the history behind it, the context of it,” said Valdez McClung, an associate director at the fast-growing IT company Cognizant. 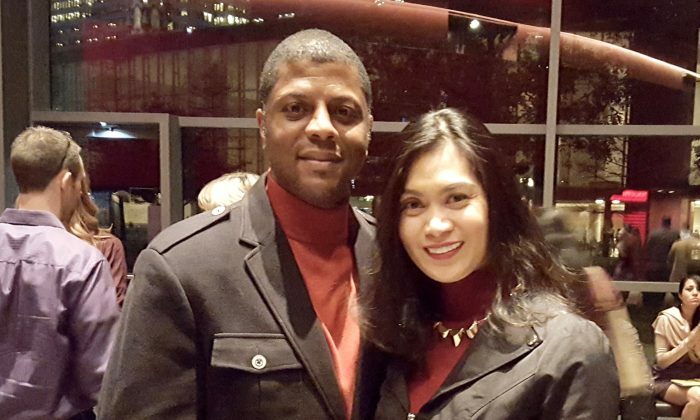 Mr. McClung, who attended the performance with his wife, Amor, at the Winspear Opera House on Jan. 8, said it was completely enlightening. Classical Chinese dance is a form that has developed through the dynasties, according to Shen Yun, soaking up wisdom and inherent values, principles, and beliefs over 5,000 years. And for Mr. McClung, that all came through in the dance. He noted the wide variety of things he learned: that the traditional culture was nearly destroyed in China under communist rule, that Manchurian fashionistas wore high shoes without a heel. He learned about the spirit of the people from the Himalayas to Mongolian, and the spirit of monks in a Buddhist monastery. “I believe tradition must be in any culture,” Mr. McClung said. People today might not want to sport the no-heel high heels Manchurian maidens wore, but there are values that extend across time and culture. Mr. McClung said if you looked at many of Shen Yun’s dances, you could see a people that cared about community. “They were helping each other and supportive of each other; they live as a community,” he said. It’s different from the prevalent culture of “self” today, he said, and something he felt important. “I love the fact that they want to embrace and educate and inform people of tradition,” Mr. McClung said. Cindy Henley, a teacher, saw in the performance a people characterized by joy and celebration. “It just brought you back to the culture and the history, and it just showed the beauty of the people, the things they honored,” she said. Ms. Henley remarked on the dances: A Tibetan “khata” scarf dance showed veneration for the divine in a jubilant way; a lively folk dance celebrated a bountiful harvest; another dance celebrated the blooming of the mystical udumbara flowers; and in one dance, female dancers twirled sparkling handkerchiefs and watched the fireworks. “They just celebrated, in honor of the people, the religions, the culture, faith, everything. They took the time to enjoy and to honor it,” Ms. Henley said. “It showed, just in the grace and the flow, and the way they used their hands, and the way they used fans, and the way they used sleeves, it just came through,” she said.